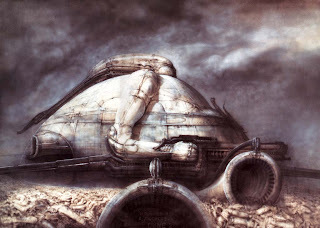 It is safe to say that David Lynch's Dune is a terrible failure, the only misfire in the illustrious director's career. 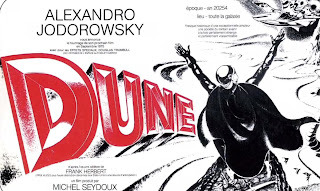 I had heard a while back than another film adaptation of Dune had been worked on but had never made it past the concept stage. All I knew about it that it was to feature Salvador Dali in its cast, and Alejandro Jodorowsky was at the helm, a director I knew very little at the time. 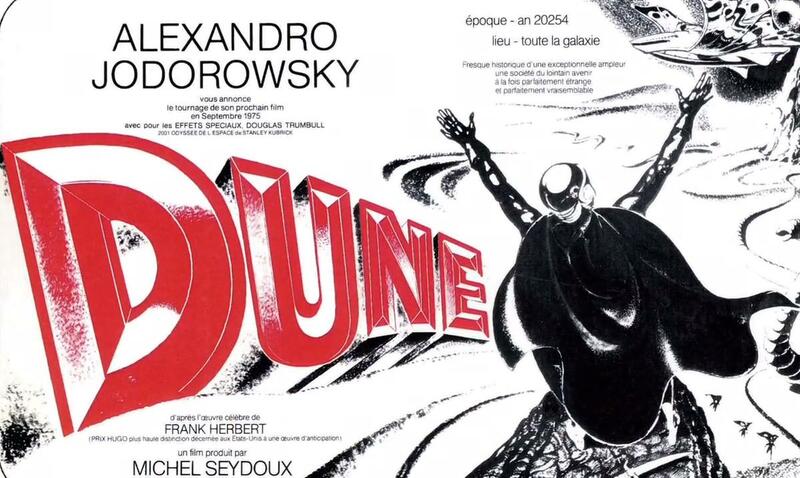 But a new documentary, Jodorwsky's Dune, which was presented at the Cannes Film Festival in the Director's Fortnight selection this year, shows how far the project went (even though it never actually reached the shooting stage), by having the director and all of those who worked on the film recall the incredible saga of the best film (well, potentially!) never made. I must admit I am still not very familiar with Alejandro Jodorowsky's work, I have only seen Santa Sangre recently (which instantly earned a spot on my top 20 of best films ever, no less), and he is known for subverting genres (westerns, giallos...) and infuse them with his blend of mysticism and crazy visuals. So in restrospect, he does appear like the best possible choice to adapt this science-fiction masterpiece that is Dune. In some ways, the director of this documentary, Frank Pavich, pretty much has an easy task. This is such a fascinating subject that all you would need is get the cameras rolling and listen to the participants. But I am being a bit unfair. He does a great jobs of interviewing all of those who worked on the film, adds a nice electronic score, and keeps it all lively with a tight editing. That other doomed film documentary Lost In La Mancha springs to mind but this is a very different story. While the Terry Gilliam film actually collapsed half-way through filming, Dune never even reached that stage. Still, the director and its increasing team were given carte blanche by French producer to work on the script, story-board, costume design... as the project was taking shape. And what a team! Please look away if you don't want to have the surprises spoiled, but they had basically assembled the most prodigious artists of their time: French graphic-novel legend Moebius, HR Giger, Michal Bannon, and a cast featuring Salvador Dali, Mick Jagger, Orson Wells, Amanda Lear (the 70 disco muse who was also Dali's muse), as well as, weirdly, Jodorowsky's son to play Paul Atreides, who seemed too young at the time, and was trained by a frankly terrifying French martial arts master, looking himself like a character from Dune, costume included. As we catch glimpses of all the work done, it is absolutely devastating that this never came to be made, especially when you compared it to the incredibly dour and visually boring version that David Lynch came up with. 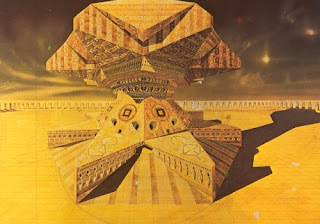 Completely out there costumes and set design projects (watch out for the Giger designed Barron Arkonnen's castle! ), full of bright colours and insane ideas, a testament to the psychedelic mood of the time and its fashion. But it was not just visually that the film promised to be ground breaking. Alejandro Jodorowsky reveals how he had significantly altered the book's last act for his script, giving the story an absolutely mind-blowing ending, very much in line with his own metaphysical interests. Yet it is no spoiler that the film was never made. Again, I'd rather not spoil it with too much details, but obviously it had to do with financing. And Jodorowsky seems at times his worst enemy, recalling how, when asked by the head of a big US studio whether he could deliver a 90 minutes, he responded that his film would be 14, 20 hours long possibly, and in all seriousness. It is clear that Alejandro Jodorwosky never completely recovered from this doomed project, and for all of his wit and spark, you can still see how much this has hurt him (also watch his amusing reaction when he decided to watch Lynch's adaptation). It is impossible to know whether he would have managed to condense the lengthy of dense story of Dune better than David Lynch, but one thing is certain, from the design elements we see throughout this documentary, it would have been one of the most unique visual treats in the history of cinema. Not that all of it was lost, a lot of his collaborators went on to use their ideas onto other films. And the director himself went on to use some of his work with Moebius on this project to make a graphic novel called The Incal. 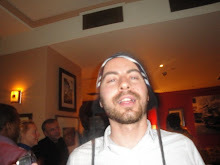 But the time frame of this project is also interesting. It was to be made just before Star Wars, which paved the way for modern blockbusters as we know them. But could the history of those have been very different, had Jodorowsky managed to make his more demanding and experimental film a success? We need visionary directors like Jodorowsky, especially in the science-fiction genre, directors with his kind of overwhelming ambition and madness. Instead we get JJ Abrams, who basically makes corporate science-fiction films. With the frankly mind blowing possibilities offered by the genre, it is beggar's belief that filmmakers are so timid or using the same well worn tropes. I was recently reading how scientists, based on observations , suspected there was a planet so dark it hardly reflected any light at all. Another one quite possibly made of diamonds. 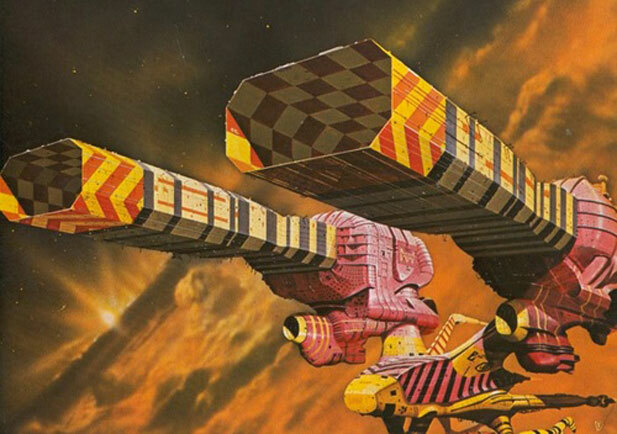 I like science-fiction that is cerebral, experimental, bold, daring, contemplative, OTT... all the things promised by Jodorowsky's Dune, and aspects we so seldom see nowadays. He did not see it as merely a film, but a mind expanding experience. Not something you would get with Star Trek Into Darkness.